The LED's are in the F/W realm of turning on a gate somewhere. Put a physical switch on each one, inline. Heater can be added to a v1.87 print file. You can also add a G4 pause for a specified period of time. I'm liking the "prep print" file option. Just pretend the print is going for say 20 minutes. There's a FAN for each Jet installed on the printer, even if you have a Duo it comes with 3 fans already.... well the 3 turn on on ABS prints! FCK!!!! I gave some thought to the 3rd party spool. Cut the stock cartridge cage down to just tall enough to fit in the holder. It maintains the chip and locks in nicely. This is best for bay 2 (middle nozzle). Run a Teflon tube from the exit hole of the cartridge to outside the door. This is just a guide to avoid kinks. 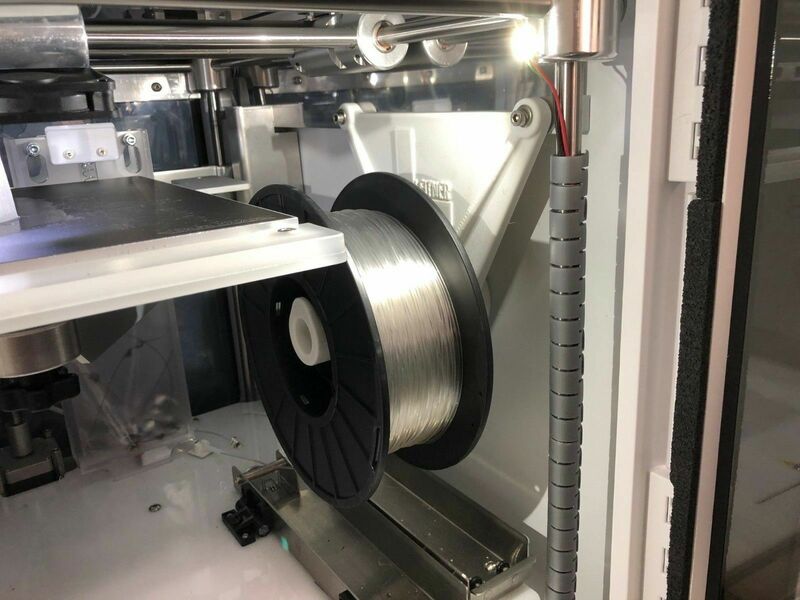 Put your spool on a spool holder, feed the mile of filament, and print. This solves many issues including the chip recharging and quick change filaments. This concept also furthers my intent of using an Arduino to provide positive pressure in the filament to combat PLA breaks in the mile of tubing. Chip holder on the cheap. I printed a something and removed most of the data. This is on the middle cartridge. M404 S55 is the chamber temp. G4 P2700 should be an 2700 second pause... 45 minutes. And M107 turns the fans off. Testing now... values above updated to match the attached file (3/7/19). Yep, that worked. The full print time is 33 minutes. It moves stuff around and parks the heads just over the build plate while the G4 command is busy. This brings the unit up to about 30*C. Running it a second time to see if it will reach 50*c. ...nope... hit about 37*C. That second half hour had diminishing returns. I need to make some larger prints and see what temperature the slicer assigns. I did have a reading in the 55*C range. I don't want to needlessly run the extruder heaters. ...at 50*C in the print file I got the upper left corner to 43*C. Not bad. Started on an elevated temp so the time is not relevant. I've seen the chamber at 55*C.
Okay Alex. I think I got what you need with data to back it. I put this toaster on for 45 minutes at 55*C. That should cover your morning wakeup call and give you time for coffee. Can be interrupted anytime short of that. You know it is at ~90% soak when you hear the heater's thermostat start clicking. I got the chamber up to 45-range and 46.1*C on the build plate. Over the several tests, all the metal was pretty much warm on my machine. Let me know how the attached file works for you. Last edited by TommyDee; 03-07-2019 at 05:08 AM. I take it the heater unit is just an ON / OFF state right? ie no "temperature selectable" right? I am selecting the temperatures in the print file. It has a thermostat. And you can hear it click. Hmmm perhaps we can find out the max temp it can deliver then? We did... see 3rd entry in #4 above. We can kick it up to 70*C if we want. But I am being conservative. So a 55*C setting will take the chill off of everything in 45 minutes. The M404 command has an S setting that is Degrees C.
Somehow I got my chamber lights to turn off. Try turning on the light in setup. That turns on the light at the extruders. Now I have a local spotlight but no blinding ambient lights. I like margins! I'm getting a good 40+C on the plate consistently after doing the heating cycle. The setup menu choice "Light", when on, does turn off the stadium lights and turns on the little light on the hot end. Did you see this one on eBay, Alex? only $29.99!